The British Gazette » Brexit: Been there! Done that! Got the T-shirt! But: I’m NO longer wearing it! 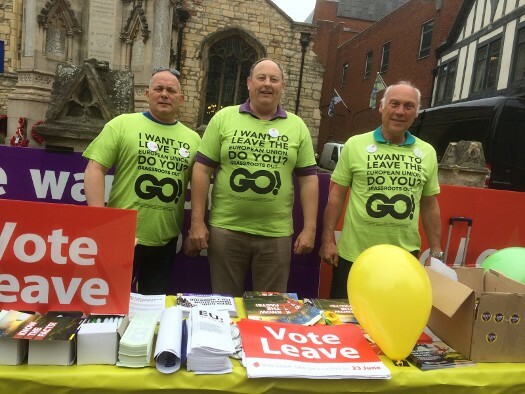 Above, three staunchly patriotic gentlemen from UKIP Lincoln during the referendum campaign of summer 2016. To those of us (especially boys) born in the decade following the end of WW2, this was a question we asked our fathers. Today, it is a question more likely to be asked of grandfathers or great grandfathers. Even today in the second decade of the 21st Century, the phrase “The War” means one thing: The Second World War of 1939 to 1945. Unless of course you call yourself, “An American” and then “The War” started on Sunday December 7, 1941 when the IJN attacked the USN Pacific Fleet in Pearl Harbor. One of the things about “Life” is the collection of memories. Good memories. Bad memories. Indifferent memories. A set of memories I will have until I breath my last will be of that summer of 2016. Of public meetings. Of leafleting and manning a stall at the bottom of Causeway Head in Penzance. Of that determined old gentlemen a “Remain” campaigner who stood outside the Leave stall holding aloft a banner – which caused your Editor to retaliate in kind against the Leave stand. This to the great protest of the Chairman of the St. Ives and the Isles of Scilly Constituency Labour Party who regards your Editor as an aggressive bully! Of a material nature, some of the things we collected were “Leave” campaign ball point pens and T-shirts. During the campaign and shortly after I wore such on the odd occasion. I do NOT wear them now! In his blog-post today (http://eureferendum.com/blogview.aspx?blogno=86642), the learned Dr. North comments upon the air of unreality abroad vis-à-vis Brexit. À propos of this public aura of unreality surrounding all discussion of Brexit, there was a worrying piece of unreality broadcast late yesterday evening on BBC2’s “Newsnight” where Evan Davis went north to Sheffield to interview a small focus group of “ordinary voters”. Some of these folk – not political activists it seems – regarded the suggestions vis-à-vis the consequences of a “no deal Brexit” made by Dr. North as scaremongering and farcical! They (including a Labour voter) could not believe that Madame Mayhem and her colleagues would cause such a thing to happen. Of course, a “No Deal Brexit” would find the UK – IF LEFT ALONE TO COPE – facing decades of economic, political and social austerity, hardship and turmoil. However, your Editor is firmly of the opinion that this will NOT happen. That is to say DECADES of economic, political and social austerity, hardship and turmoil. Months, yes, possibly. Decades, emphatically NOT! Because of the EU and importantly TWO of it’s members. Allow us Dear Reader to draw your attention back to the old gentleman with his “Remain” banner at the bottom of Causeway Head that June. The old gentleman was a most determined activist! His reason for supporting the UK’s continued membership of the EU was articulated in one word: “Peace”. This for him was THE one overriding argument. Now, we can argue the toss over the reasons for peace in Europe post 1945, but the FACT is that the prevention of another European War was one of the key factors in founding the EU. Historians will note that the Second World War arose out of the consequences of the First World War. The reparations demanded by the Allies and the occupation of the Rhineland by French and Belgian troops and the collapse of the German currency brought about the Third Reich. The Germans know only too well the consequences of forcing a large populous industrialised country into penury and chaos! Some very nasty creatures emerge from under the rubble! Then there are the Irish. The Republic of Ireland’s largest trading partner – by far – is the UK. Of the EU 27, Ireland will be the most severely affected of all EU countries by a “No Deal Brexit”. 1. The EU 27 making an offer to the UK to extend the two year time period under Article 50. 2. The EU 27 to accept a request made by the UK to extend the two year time period under Article 50. 3. IF the UK does not make such a request, and crashes out of the EU, the EU 27 will make an offer to the UK to re-enter the EU on emergency terms which will contain the requirement to join the Eurozone. Given the slow pace of the Brexit negotiations and the FACT that there are only 524 days to Brexit Day it appears that IF Brexit takes place on that day it WILL be a chaotic “No Deal” Brexit. 1. Conclusion of a transitional treaty that has the UK continuing as a member of the EEA and the EU’s Customs Union after 11:00PM on Friday 29th March 2019 (aka Purgatory). 2. UK withdrawal from the EU’s Customs Union when the necessary infrastructure is up and running on the borders. 3. UK instigated reform of the EEA or withdrawal from the EEA at some indeterminate point in the future. Your Editor will now address the issue of a “No Deal” Brexit taking place at 11:00PM on Friday 29th March 2019. IF such a Brexit takes place it is likely to have taken place due to stupidity and ignorance on the part of British politicians. This is because of the consequences – for them – of a “No Deal” Brexit. Be under no doubt: The consequences will be VERY severe! In fact, should a “No Deal” Brexit take place one could expect many of the wealthy key Brexiteers (the ones with money) will flee the country for their own security. What do you want? Another referendum? We should all pull together and stop talking the country down. of course with all the Remoaners and others saying, “How Awful”, it will be and letting the EU limit the negotiations, the EU will realise there is a chance of a deal being voted down so every incentive for them to punish us. If they thought we will walk away if they are not sensible in dealing with us, they might give a sensible deal. Otherwise leave with no deal. That will cost them more as they sell more to us than we do to them. Do not be so gloomy.